The U.S. automakers played a key part in last night's third State of the Union address by President Obama. Obama said: "On the day I took office, our auto industry was on the verge of collapse. Some even said we should let it die. With a million jobs at stake, I refused to let that happen. In exchange for help, we demanded responsibility. We got workers and automakers to settle their differences. We got the industry to retool and restructure. Today, General Motors is back on top as the world's number-one automaker. Chrysler has grown faster in the U.S. than any major car company. Ford is investing billions in U.S. plants and factories. And together, the entire industry added nearly 160,000 jobs. We bet on American workers. We bet on American ingenuity. And tonight, the American auto industry is back." After last night's State of the Union speech President Obama said he would like to see half of the savings created by withdrawing troops from Afghanistan and Iraq to rebuild U.S. infrastructure, helping companies ship goods more efficiently. The plan would fix existing roads and invest more in high-speed rail, according to the fact sheet. "Take the money we're no longer spending at war, use half of it to pay down our debt, and use the rest to do some nation-building right here at home," Obama said yesterday. He didn't specify how much the government expects to save. And that's what may make this idea dead on arrival when it gets to Congress. "I'm not entirely convinced that reallocation of war funds will necessarily pick up enough momentum to gain traction in Congress," Patrick Hughes, an analyst with Washington-based research firm Height Analytics, said in a telephone interview yesterday with Bloomberg. Six years into a comeback from near collapse, Ford's ditching the remake of an old ad slogan — "Drive One" — with a new slogan designed to, as Reuters tells us, "underscore confidence that its recovery is almost complete." That slogan is "Go Further." The new tagline will be used in marketing campaigns, replacing "Drive One" in North America and "Feel the Difference" in Europe, both initially coined to help overcome wariness on the part of consumers about the quality and performance of Ford cars as the car maker bounced back from the horror that was the "Bold Moves" campaign. I'm a Michigander. As such, I hate Ohio. Mostly because of that one time when we got into a shooting war with them over Toledo. It was a war that ended with Ohio getting Toledo and Michigan getting the Upper Peninsula. Despite the seemingly fair trade, I've still always held a grudge. But now that Honda plans to build the hybrid Acura NSX — the most expensive (at over $100,000) and technologically-advanced car ever built in the U.S. by an Asian or European automaker — the state I normally try to forget has sort of ruffled my feathers a bit. What, Michigan's too good for you, Honda? What was that you say — something about unions? Oh, come on, like Ohio's all that much different than Michigan — the Teamsters are totally able to drive 100 miles. Whatever. If only I could give Honda the finger — except for this damn mitten. Car tells us this morning that BMW is expected to show the new 2012 M6 super-coupe at March's 2012 Geneva Motor Show. They tell us that BMW will unveil the M6 in coupe guise first, but also expect a convertible M6 this summer, and maybe even an M6 four-door based on the 6-series Gran Coupe. Under the hood, the new faster-kill 6-series is essentially an F10 BMW M5 in two-door drag. That means the same bi-turbo 525 HP and 501 lb-ft o' torque-mustering V8 and because the two-door is even slippier, it's expected to best the four-door's performance figures. Yowza! See more, including an artist's rendering, here. 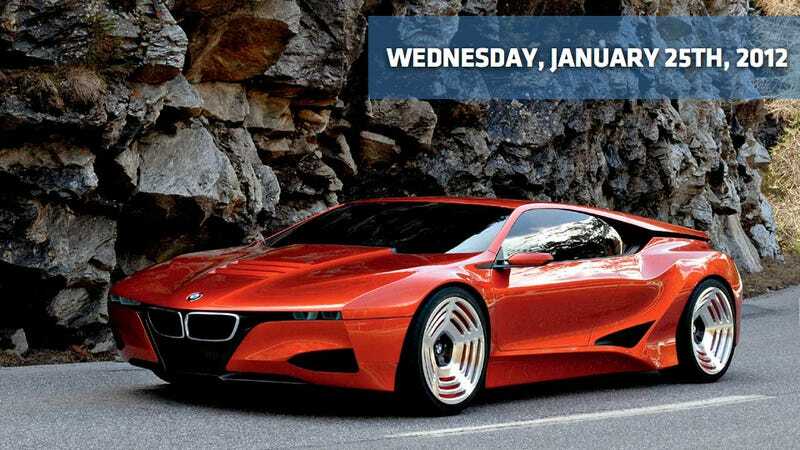 Speaking of fast-as-hell BMW two-doors, ever since the stunning M1 Homage concept was shown at the Villa D'Este Concours in 2008, we've been salivating over the idea of a new M1. But although BMW M development boss Albert Biermann put those rumors to rest last year, it doesn't stop folks from dreaming. Like the boys at Autocar who claim that an insider says BMW M wants their own supercar. "M wants to build its own car," said their insider. "BMW has a great heritage of super-coupés and the M6 is the latest part of that. But we also want to do something that we can call a ‘super sports car'." Sounds like somebody at "M" is hoping somebody in Munich's reading Autocar. I hope they are too.